We are sad to inform you that Chance Hill will no longer accept new sign ups and will not anymore offer online services! For those who are looking for an online casino, Chance Hill Casino is worth a look. Licensed and operated under the UK Gambling Commission and Malta Gaming Authority, it is an option for Australian players who are looking for online pokies. Those who are looking for great games or a no deposit bonus are sure to enjoy Chance Hill Casino, which is a newer online casino that offers many of the things that the bigger, older and better-established online casinos have to offer. Chance Hill Casino is a relatively new online casino that was established in 2015 in Madrid. It was created by a group of gaming enthusiasts who love to play pokies and other games. Since it is a newer casino, users can expect to enjoy a modern experience on their computers and mobile devices. One thing that users often notice when visiting Chance Hill Casino is the fact that its pages are much “cleaner” and more professional-looking than the pages on many online casinos. Many online casinos are riddled with ads, but this is not the case on Chance Hill Casino. The website is clean, easy-to-use and pleasant to look at, and it is simple enough that it works well on mobile devices. Those who want to play free pokies might be looking for a casino that offers free pins for new sign-ups. Currently, Chance Hill Casino offers a few bargains for both new players and those who have been using the casino for a while. New users can earn up to $400 and 150 free spins as a welcome bonus. This is paid out in three increments. Upon their first deposit to the casino, new users can get their initial deposit matched up to $100. New users also get 50 free spins to help them get started. Upon the second deposit that a new player makes, Chance Hill Casino will match their deposit at 50%, up to $150. At the second deposit, players are given 50 free spins. On their third deposit, users once again get a 50% match up to $150 and are given 50 free spins. For new users who are looking to get started on the right food, these free pins and match bonuses can be incredibly helpful. Chance Hill Casino offers bonuses beyond the initial welcome bonuses, too. On Mondays, those who deposit between $20 and $50 get 40 free spins. Those who deposit more than $50 get 60 free spins, allowing them to enjoy free pokies as a means of starting off the week! On Wednesdays, Chance Hill Casino offers a cashback offer for players. Players who abide by a few simple conditions get 20 percent back on all of their losses on Wednesdays. Then, on Saturdays, users can start off their weekend the right way by getting a 50% match on up to $50 in deposits. In the past, many players liked to enjoy their favorite online casino games from the comfort of their homes, on their computers. However, nowadays, many users do not want to be restricted. Many people like to play online casino games on their smartphones or tablets, and for these users, it’s important to choose an online casino that is mobile-friendly. Luckily, Chance Hill Casino fits the bill. 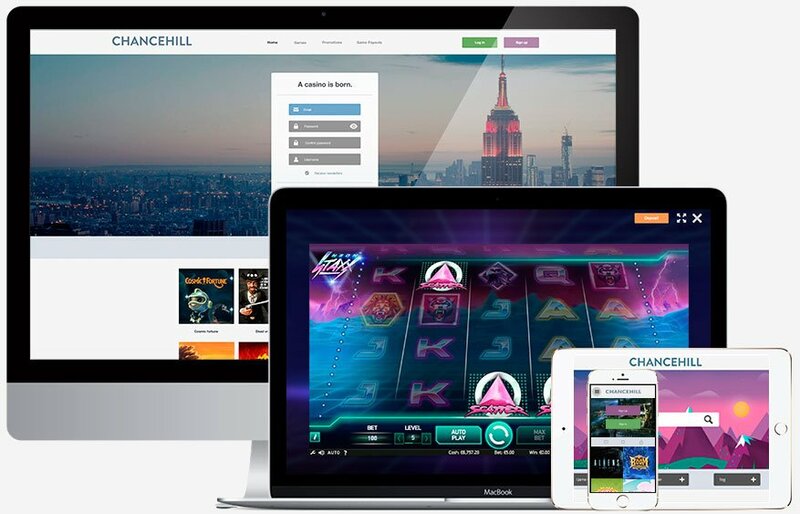 Unlike many casino websites, Chance Hill Casino offers a sleek, streamlined page that loads just as well on a mobile device as it does on a computer. Plus, once users have their sign-in information, it is easy to transition back and forth from the computer version to the mobile version, allowing users to hunt for their no deposit bonus and play their favorite games from wherever they might be. Chance Hill Casino offers games from all of the big names that users have come to know and love, such as Microgaming, Live Casino, iGaming to Go and more. Even though Chance Hill Casino does not offer exclusive games, it does offer many pokies that users are looking for, such as the Guns N Roses game, Koi Princess, Mega Moolah, Hook’s Heroes and more. 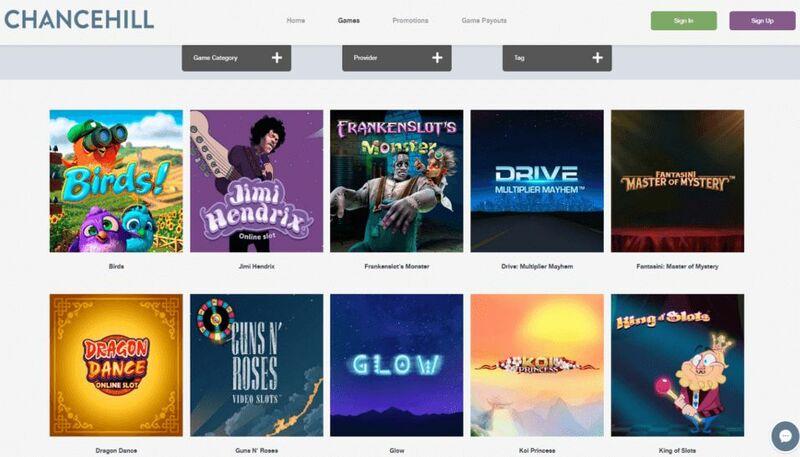 Users can explore all of their old favorites and can check out new games that they have never played before, from top game providers, upon visiting Chance Hill Casino. In order to get started with the fun, users have to be able to deposit their funds. At Chance Hill Casino, there are a few ways to make deposits and withdrawals. All of these options, other than PaySafeCard, can also be used for withdrawing money from a Chance Hill Casino Account. Money must be withdrawn in the same way that it has been deposited; for those who want to withdraw their money in another way, they will have to make a minimum deposit of $10 from this payment method first. In order to withdraw money from a Chance Hill Casino account, users must have at least $20 available to withdraw. Since the team that created Chance Hill Casino is made up of people who love playing online pokies, they are dedicated to offering top-notch customer service to their users. For one thing, users can check out the extensive online help center, which offers answers to commonly asked questions and can often provide the help that users need. For those who want to communicate directly with someone from the casino, there are a few methods of contact. The casino can be contacted by telephone at +34917377697 or via email at [email protected] There is also a live chat function that can be used to get assistance and immediate answers to questions without the need to make a phone call. Chance Hill Casino is not as well-established as some of the other online casinos out there, but it’s still a viable option for those who are looking for online gaming. Making a deposit and taking advantage of the deposit bonus can be a great way to give this online casino a try.